Boris Bikes and two Starbucks on every corner. Where else but swingin' London? Excitingly, I've been let out for the day to go visit the fine folk in our other less fashionably located office. Before we get down to the serious business of the day which, curiously, starts at 2pm, it's lunchtime. Coming along to the caff, Ed? Abso-bloomin'. Through the capital's golden alleyways and we're on bustling Whitecross Street, home to a thriving takeaway food market. Tapas, chorizo sandwiches, falafel, Portuguese goodies, Brazilian stews, all present. 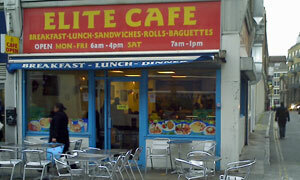 Another time, dear traders, since our destination is there on the corner, the Elite Cafe. Squeeze past the hi-vis blokes at their Kesgrave Kitchenesque fixed tables to a rare spare four-seater towards the rear. Sitting among the box of unbranded condiments is a trusty laminated menu, or you can gawp at the huge printed version above the counter. Waitress service -- nice -- and the three of us each pick a different set menu, much like Kenny's. Can't come here and not order eggs / bacon / chips / beans (EBCB), plus a Dr Pepper for the nerves. Establishment such as this has to be efficient, and bam, here's our food, a sizeable oval plate covering most of the main food groups. As I take those calories on-board, I'm staring at the large wall print of a Swiss scene, trying and failing to find the Von Trapps. Couple of minutes in and that crockery still contains the best part of a family portion. Ran out of time for the cherry pie and custard, as advertised on the handwriten note tacked on the main menu. Would have been good with a frothy coffee. Back to work, job done. If it was a car -- Morris J2. If they were passing by -- Andy Parsons.